After an eventful showing last weekend in the Belgian Europa League playoffs for Royal Excel Mouscron, Liverpool loanee, Taiwo Awoniyi has been named to the Belgium Team Of The Week. The Nigerian rose highest to nod in his side's equaliser against Kortrijk, a game which they went on to win 2-1. That effort took his tally for the season since joining Mouscron on loan from the Merseyside Reds to ten goals after 31 outings in all competitions. 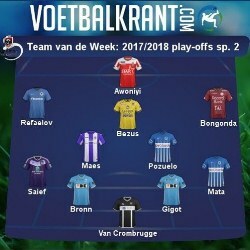 In a 4-2-3-1 formation selected by voetbalkrant.com, Awoniyi started upfront. His goals have helped his team to the peak of their play-off table after they won their first two games, with the 20-year old scoring in both games. The team will again look up to him when they face Zulte Waregem next Saturday in another play-off tie. Awoniyi is contracted to Liverpool till the end of the 2020 season.